The registration is now open. Click here to proceed to the registration page. Please follow this link (opens in a new tab) to proceed to the registration page. Current full conference fee (until March 15th): 6500 NOK (including all catering (lunch, dinner), transport between Trondheim City Centre and the conference venue, and social events); 7000 NOK after March 15th. Accommodation can be booked through the registration process. Early-bird registration ends: February 28, 2019 – extended to March 15, 2019! The abstract template can be downloaded from this link. 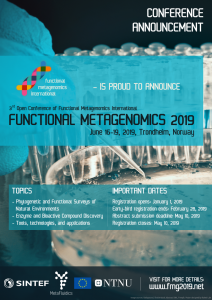 Functional Metagenomics 2019 aims to bring together the leading researchers in the field of Functional Metagenomics. The conference program will include the latest experimental advances and technical developments in the fields of metagenomics based gene discovery and analysis, with clinical, industrial, and environmental applications. If you would like to get updates please drop us a line using the form below. Please feel free to download and distribute the poster.